The Renaissance City Winds have been giving school concerts and extended residencies since their very first season in 1975-76. The ensemble is a juried roster artist with the Pennsylvania Council on the Arts’ Arts-in-Education program, which provides financial assistance to schools and districts hosting a residency. 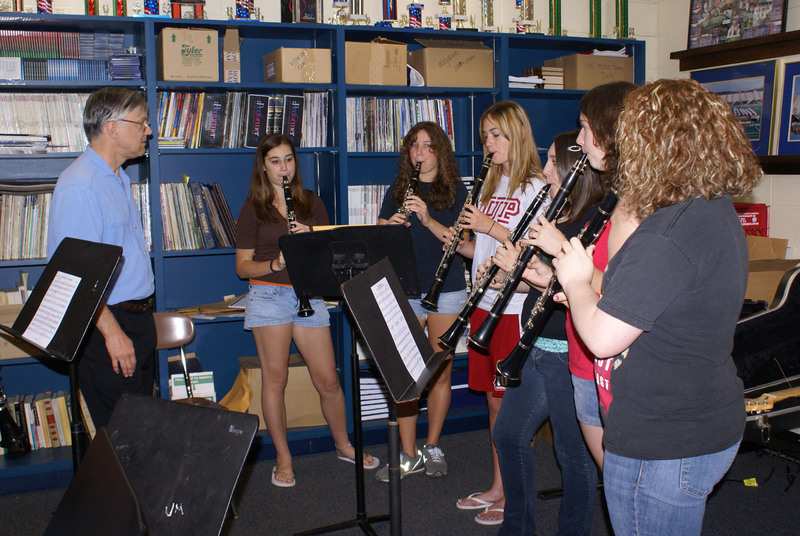 Some residencies are in a single building of middle- or high-school level; others are hosted by districts so the ensemble works with different age groups in several buildings. Typical residencies in southwestern Pennsylvania are one to three weeks; on tour, they are generally two to five days which may be spread out over several trips if desired (this is required for the composer program). Lecture-demonstrations for assemblies or classes. Performances with themes can feature music of Pennsylvania, music by women composers, and American music of various ethnic backgrounds (including works by African-American, Hispanic, and Native American composers). A study guide is available for elementary schools so teachers can prepare their students. Chamber music workshops. The Winds can coach a variety of small groups, including both brass and wind quintets and octets; saxophone quartets, flute or clarinet choirs and double-reed quartets; and mixed chamber ensembles including piano, voice, guitar, strings, and extra winds. Similar workshops can be presented for adult amateur performers who wish to play together and be professionally coached. Composer project works with students in sixth to ninth grades to begin composing melodies and organize them in logical forms. Professional composers arrange completed pieces for student ensembles or the Renaissance City Winds to perform on the residency’s concluding concert. This project requires repeated contact with the same small groups of students (at least 4-5 sessions) and at least two months of calendar time to allow for the work to get done. For more information and examples, see the “Young Composer Program” page. Young Composers (childrens’ programming for quintet, generally presented as part of school residency) A program by composers under the age of thirty, to change the impression that “classical” music was written by old men a long, long time ago. Music ranges from pieces by the young Beethoven to 1900-era ragtime by a young woman from Indiana to pieces composed by sixth- to eighth-graders in recent Renaissance City Winds residencies. Windsome Friends (childrens’ programming for quintet, generally presented as part of school residency) Elementary school students will make new friends for life when they meet the Winds! A variety of short pieces, including familiar tunes drawn from cartoons and movies, capture and hold the attention of a very young audience. Demonstrations of reeds and a horn made from garden hose make music-making come alive! A study guide is available in advance for teachers and parents. The Renaissance City Winds is part of the Arts Education Collaborative‘s network of organizations.